Ketidaktahuan dan ketidakpastian kadang-kadang jauh lebih membunuh dibanding pembunuhan. Laut Bercerita tells about a college student named, Biru Laut. Some people perhaps were born to live in their idealism. They want to do something for the country, they want to have an ideal government who care about its people, while the government itself is not that friendly in receiving the critics. It happened during Suharto's era. The New Order was considered as a dictator. Violating the human rights, unfairness in politics and economics, etc. Until we heard that 23 persons were kidnapped on May 1998 and up until now there are still 13 of them that have no news yet. Laut Bercerita took place during 1991 until 1998. 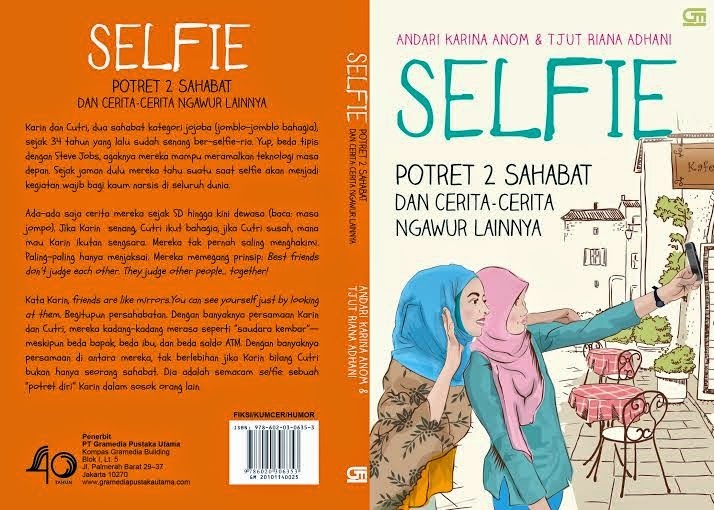 The book tells about the loss felt by the families and friends of their beloved persons. There is also betrayal and a very sadistic torture by those for whom power is more valuable than lives. There are parents who always put one extra plate during their family lunch just because they hope their beloved one will suddenly come and visit the house. This kidnapping mostly changed the lives of the family and friends. Reading this book really needs a strong heart since the story felt so real (yes, it's based on true events) and some of these missing people are still gone and to date government also seems not to do any significant efforts to reveal the case. Begitu hujan mulai membasahi Tanah Kusir, aku merasa para penghuni makam terbangun dan membunyikan serunai. Mereka menghibur kami, orang-orang yang tak memiliki makam orang-orang tercinta. The author, Leila S. Chudori, a senior journalist, said that this book was inspired by her friend's story, Nezar Patria, who was kidnapped with other 20 persons due to their activities considered as a threat for Suharto's government. Nezar and some of his friends were released however there are still many of them that have no news at all up until now. The families and friends left are living with endless pain for the rest of their lives. Their lives will never be the same again. One of the best Indonesian books in 2017. A must read to learn about Indonesian history. Several researches show that Indonesian people are not into reading books. It is referred from the data of reading interest that is quite low or we can also simply just check the bookshop, even in a big bookshop like Gramedia, nowadays I saw at cashier that people mostly bought stationery or other stuffs instead of buying books. No wonder that bookshop must do something to SURVIVE. I noticed that one of my favourite bookshops, Gramedia PIM, now has a cafe inside its bookshop. While the stuffs sold there also having more variation, I found some outdoor activities equipments, shoes, even head scarf aka hijab. There is nothing wrong about it. As long as books are still there and these new stuffs are still in line with the business, well...just go ahead. By the way, I am happy with the cafe since I can just sit there, order my favourite drink and drown in my new book. Other trends that I notice in the bookshop is the books form. If in the old days we only have novel or comic but now you can easily find lots of books with beautiful illustration, quotes, variation of colours, and all. These illustrated books will really help people that not into thick books, at least when they are bored with the texts then they can just focus on the illustration and vice versa. You know Diana Rikasari right? She's one of the most creative and popular fashion bloggers. Although I am not into fashion especially Diana's style that sometimes too bright (although it is always looks good on her) however I always love the way Diana writes. From her writing I learned that she's really a hard worker, humble and very true to herself. Respect. These #88LOVELIFE consists of three books. Diana divides it into Part One about 88 Thoughts on Love and Life, 2nd book is about Passion and the last book is about Priorities. Each book is enriched with some thoughts, quotes, illustration, stickers, postcards, and all are in colourful ambience. Simple writing with deep meaning. A mood booster. Stories for Rainy Days #1 and #2 are kind of novels that are written down in a beautiful way by Naela Ali. It's actually a romance. Boy meets girl. Fall in Love. Broken Heart. Such a cliche however you will enjoy it. Naela with her simple yet magic words and illustrations will fascinate you, force you to finish the book and can't wait for the ending. This serial is quite successful. Book #1 since it was launched on May 2016, now it has reached the sixth printing in August 2017 while Book #2 since the first printing on February 2017, currently has had the fourth printing. If you love raining, music, touching love story that can warm your heart, this is the ONE. Other book by Naela is Things and Thoughts I Drew When I was Bored, this book is more on random stuffs that came to Naela's head and then transformed into writing or drawing. Interesting still. From its catchy title, you can guess what the book is about. The special thing about this book is the awesome illustration for every topic of the book. Kudos to the illustrator, Emte, he can put the wording into perfect illustration. Love it. It's time for you to choose, which book is perfect to accompany you during the holiday? "Not all classrooms have four walls. Through travel, the world becomes a classroom." We really felt we're lucky when we rented Korean traditional dress (Hanbok) and walked through Bukchon Hanok Village for photo session. This place is always full of tourists but that lazy hot afternoon we only met couple of tourists. Bukchon is a 'house' for around 900 Korean traditional houses (Hanok). Every spot here is beautiful. Try to get lost in the alleys while enjoying the houses, the walls, the roofs, the garden and everything, you'll feel that you're sent away to Korea in hundred of years a go. Bukchon is such a contrast with the modern city afar. Beside Bukchon, we also dropped by at Gyeongbokgung Palace and got the opportunity to watch the changing palace guards ceremony. I didn't shop much since I need to accompany my girls there. We just tried several cute-look-yet-yummy snacks sold by the street hawkers there. Seoul was the last place we visited during our eight-day of backpacking with kids. The girls were super happy. They kept saying, 'This is the best day in my life." All in all Korea is not only K-Pop or DraKor. It is also an alternative destination for backpacking with kids. "Holiday with young kids isn't about the holiday, (because let's face it, it's beyond exhausting), it's about making MEMORIES."